A delegation of U.S. military veterans will protest U.S. funding of the Israeli military at the American Embassy in Tel Aviv at 9 am, Friday, November 22. Members of Veterans For Peace (VFP) is touring Occupied Palestine, observing conditions on the ground and meeting with leaders of the nonviolent resistance to the Israeli occupation. 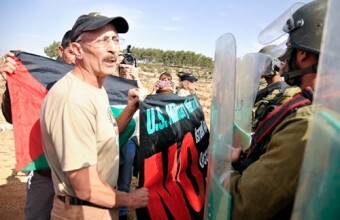 In Bil’in on Nov. 17, the veterans experienced tear gas made in their own country.